This is definitely the cake Bruno Mars croons over in his 24 Carrot jam. It does, in fact, only contain eight large carrots, but I think you’ll let it slide after you taste it. 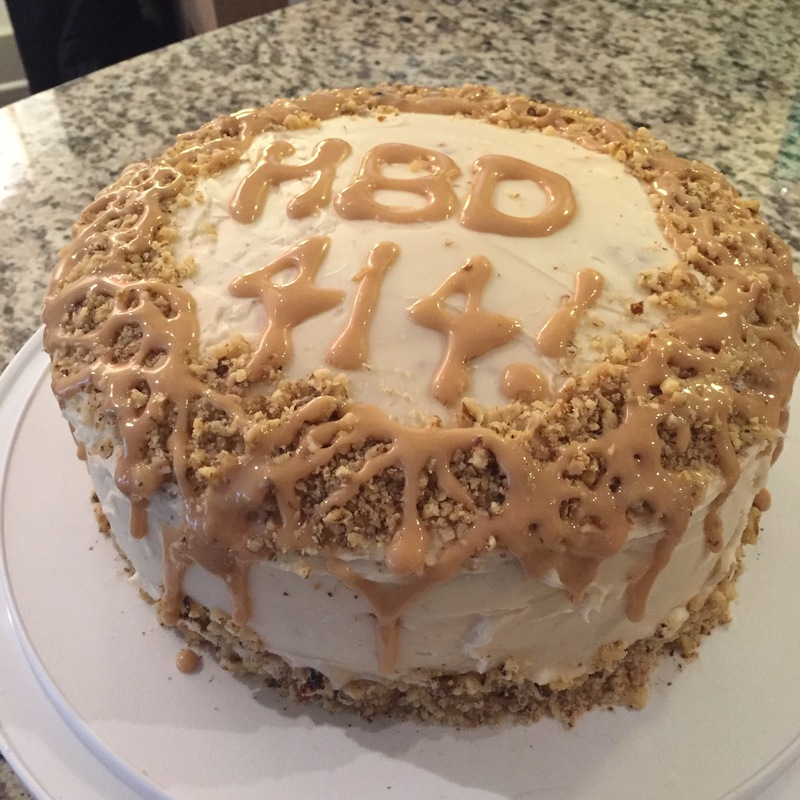 My next door neighbor did (apartment 414) when he ate HALF of this cake in two days. That is an impressive feat given that this cake is fairly heavy and the cream cheese frosting (with carmel accents) doesn’t play either. 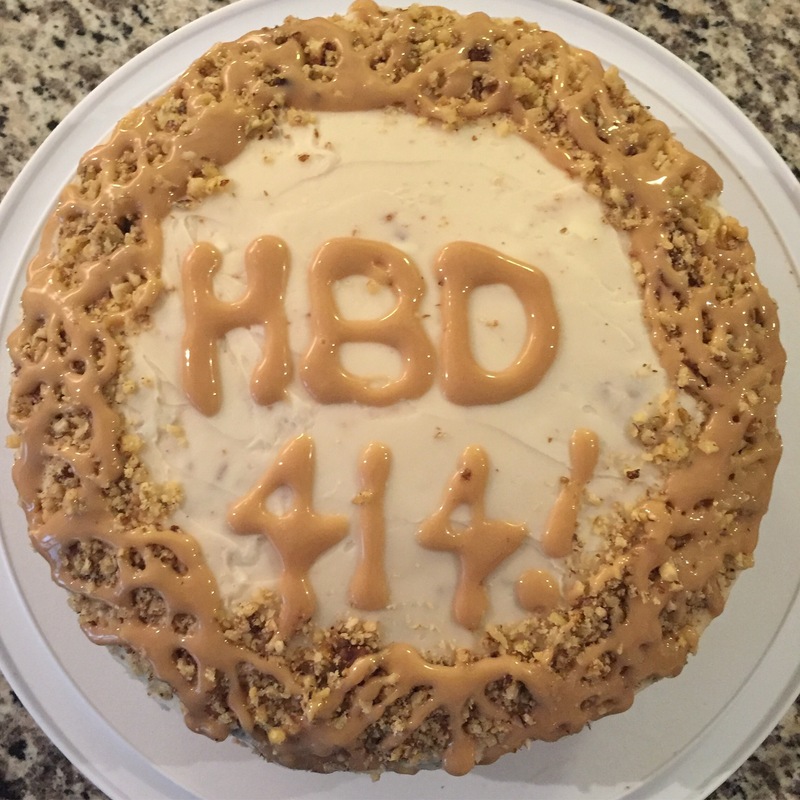 However, to be fair, my neighbor basically introduced himself as, “Hi I’m 414. You bake? When are you going to make me a carrot cake?” This weekend we celebrated his birthday and his request finally came true, even if it just lasted for a day or two. This recipe is my mum’s. With so many resources available for recipes, twists on classics, healthy twists on classics, etc., etc., I don’t make many of mum’s recipes much anymore. This one though is a keeper and I just don’t see a point in trying any other carrot cake recipe. 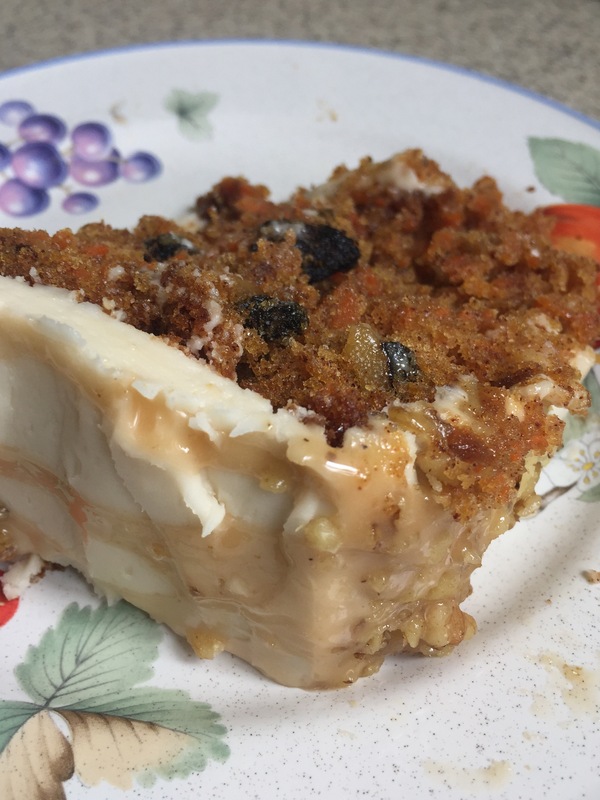 My dear friend took the other chunk of cake home and ate it the next morning for breakfast. Line two 9″ cake pans with parchment paper and grease the sides of the pan. Beat sugar and eggs together until thick and light in color. Add flour, baking soda, baking powder, and cinnamon. Stir in carrots and nuts. Divide between pans and bake 40 minutes. Cool in pans for 5 minutes, then invert onto cooling racks until totally cool and ready to ice. Beat together cream cheese, butter, and vanilla. Slowly beat in powdered sugar until smooth and of a spreadable consistency. You forgot step 9: If ants entirely cover the cake in a writhing mass, take it across the street and throw it in a construction dumpster.